Antarctica has been inspiring explorers for centuries. 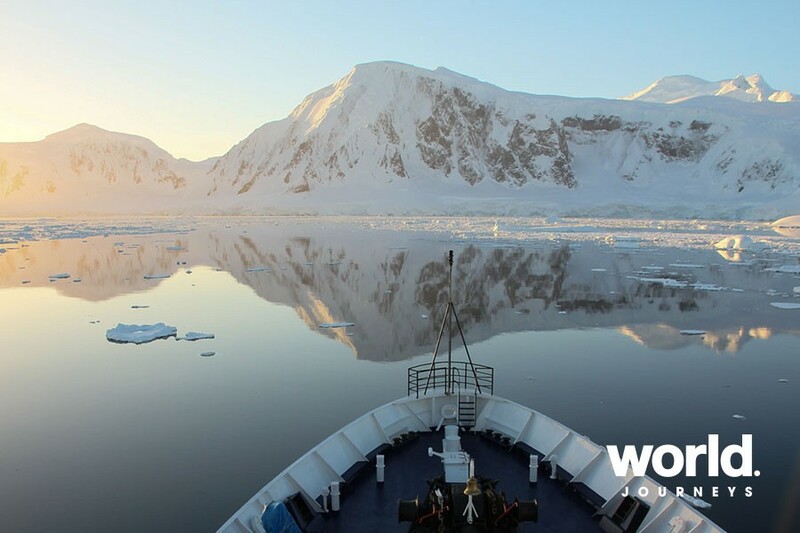 And this expedition offers you the chance to discover why, with an unforgettable journey through the spectacular wilderness of the South Shetland Islands and Antarctic Peninsula. You'll encounter a world where nature creates the rules, her unpredictable temperament making each trip unique, exciting and personal. Imagine cruising in a Zodiac through crackling sea ice like shattered glass, witnessing penguins building their nests, or navigating through a maze of icebergs, each one uniquely shaped by its journey through the sea. 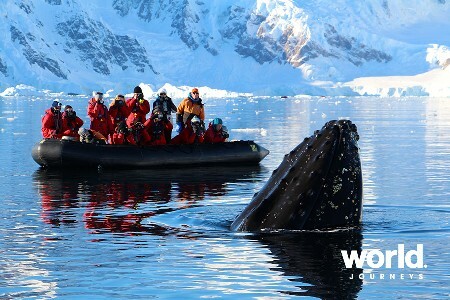 You'll enjoy iconic Antarctic highlights, exhilarating adventures and be rewarded with memories to last a lifetime. Ocean Endeavour is a comfortable, well-appointed small expedition ship expertly engineered to explore the Polar Regions. It features an ice-strengthened hull, Zodiacs for exploration and remote landings, generous deck space and advanced navigation equipment. The ship has many superb amenities including a nautical lounge, two restaurants, sundeck, and plenty of deck space for observation of polar landscapes, and lounges for learning and reflection. The ship's interiors have a contemporary aesthetic that provides a bright and spacious feel to the cabins and common spaces. Ocean Diamond is a modern, stable super-yacht, and one of the largest of our small expedition ships. Carrying a maximum of 189 passengers, and with two stabilizers and an ice-strengthened hull, this outstanding vessel is ideal for polar expeditions. 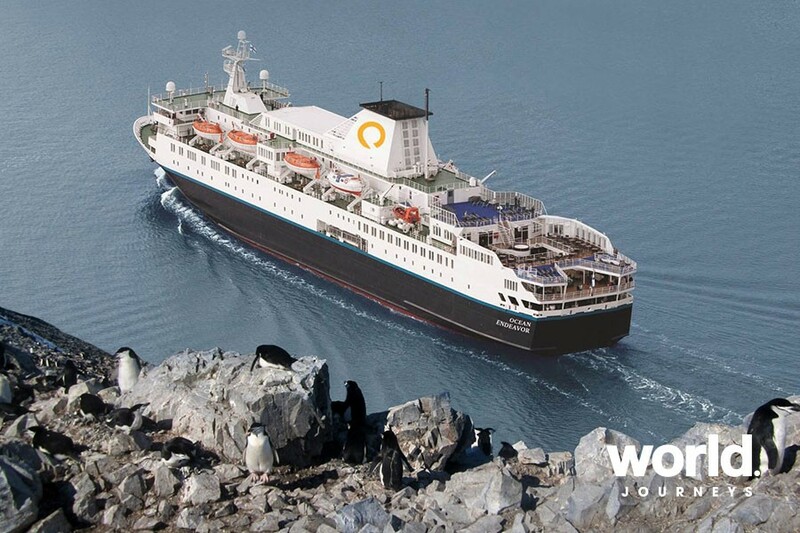 Ocean Adventurer As of June 2017, Quark Expeditions' much beloved polar expedition ship the "Sea Adventurer" will be undergoing a multi-million-dollar renovation and be officially renamed the "Ocean Adventurer". Day 1: Ushuaia, Argentina With a population of more than 63,000 people, Ushuaia is the southernmost city in the world. The city has grown over the past few years, yet it has retained an easy going and accessible feel. With the sea to the south and mountains to the north, Ushuaia is a spectacular departure point for your Antarctic cruise. If you arrive early, you can spend some time in the nearby Tierra del Fuego National Park, enjoy some Argentinean wines and barbeques in the city, or visit the many boutique shops and cafes before you leave for your expedition to Antarctica. Day 2: Embarkation Day Embarkation will occur in the late afternoon, after which your vessel will sail down the historic Beagle Channel. This historic channel transects the Tierra del Fuego archipelago in the extreme south of South America. Expect an air of excitement as you depart - the next time you see land you'll be in the world's most southern continent! Days 3 & 4: Crossing the Drake Passage Prepare yourself for potentially rough water, but hope for a smooth sailing as the Drake is unpredictable and always changing. You'll spend these first days getting to know your shipmates, while we'll provide safety briefings and insights into what excitement lies ahead. Days 5 to 8: South Shetland Islands and Antarctic Peninsula When the Antarctic Convergence is left in our wake, you will truly begin your Antarctic adventure. It is perhaps the first sight of land itself that is embraced as the true beginning of any Antarctic expedition. You can begin to appreciate why this region has long captivated the attention of explorers and travelers alike. 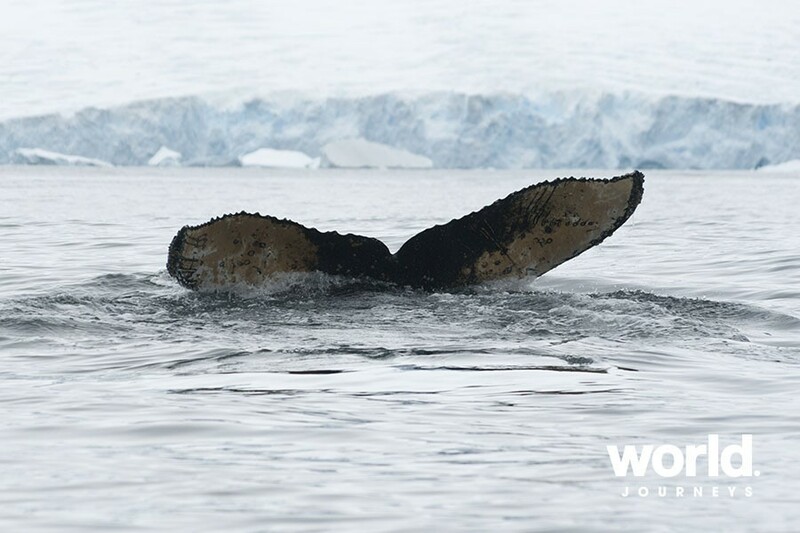 Every time we visit Antarctica we witness something new or unexpected, meaning your expedition will be unlike any other, creating a unique, personal experience. We will take Zodiac excursions from the ship to explore bays, channels and landing sites each day. 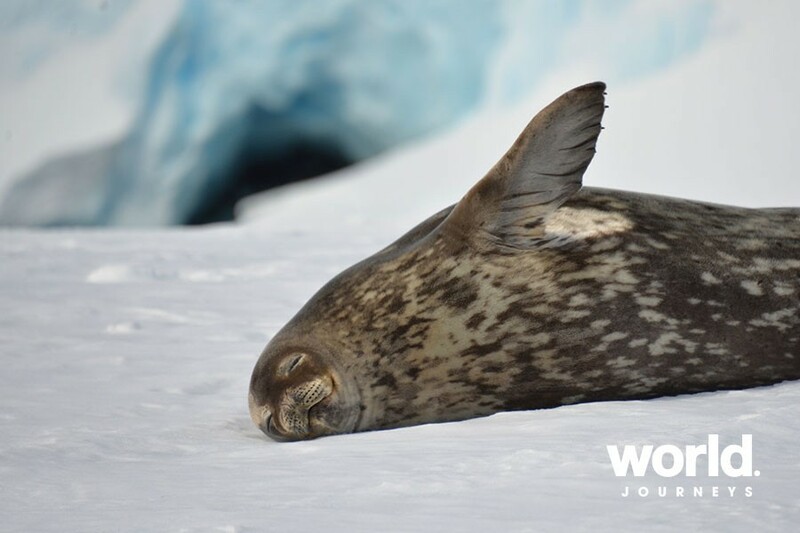 With wildlife always at the forefront of our minds you will visit penguin rookeries, scout for humpback and Minke whales and search for a number of the southern seal species, including the cunning leopard seal. The majesty of the Peninsula's mountains will enchant you as you scramble up snowy pathways to vantage points offering you 360 degree views of your surroundings. One of these in particular, in Orne Harbour, gives the opportunity to visit a chinstrap penguin colony high up on a ridge. Here you'll have the choice between going for a mountain hike or spending time sitting quietly on a pebbled beach to enjoy the antics of curious penguins. If you're feeling extra adventurous, participating in the Polar Plunge swim is about as crazy as it gets! 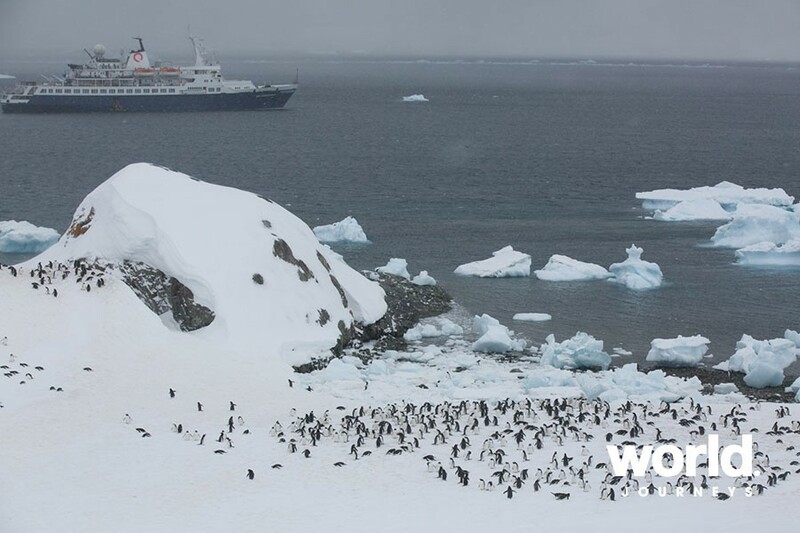 Amidst the serene silence of Antarctica, noisy interludes now become indelible memories, such as penguins squabbling over prized pebbles, or the boom and crack of a calving glacier in Neko Harbour. Days 9 & 10: Drake Passage to Ushuaia The journey back across the Drake Passage provides you with some final opportunities to enjoy the crisp Antarctic air. Spend time on the deck watching for seabirds and scouting for whales, enjoy a few final presentations by your Expedition Team or simply relax and reminisce about your experiences. Day 11: Disembarkation in Ushuaia You will arrive in Ushuaia in the morning allowing for you to continue your adventure on land or catch your flights home. Day 2: Charter Flight to Ushuaia, Argentina and Embarkation After breakfast at the hotel, the group will transfer to the airport and board our private charter flight from Buenos Aires to Ushuaia, Argentina. Upon arrival, we'll take a short city tour of this quaint port town before heading to the pier. Days 5 to 8: South Shetland Islands and Antarctic Peninsula It is perhaps the first sight of land itself that is embraced as the true beginning of any Antarctic expedition. You can begin to appreciate why this region has long captivated the attention of explorers and travelers alike. We will take Zodiac excursions from the ship to explore bays, channels and landing sites each day. 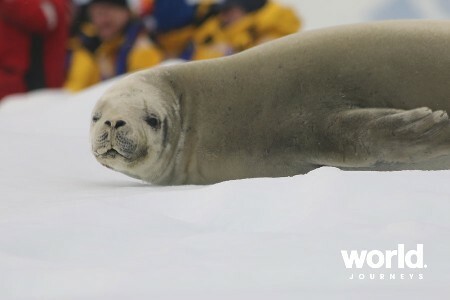 With wildlife always at the forefront of our minds you will visit penguin rookeries, scout for humpback and Minke whales and search for a number of the southern seal species, including the cunning leopard seal. The majesty of the Peninsula's mountains will enchant you as you scramble up snowy pathways to vantage points offering you 360 degree views of your surroundings. One of these in particular, in Orne Harbour, gives the opportunity to visit a chinstrap penguin colony high up on a ridge. 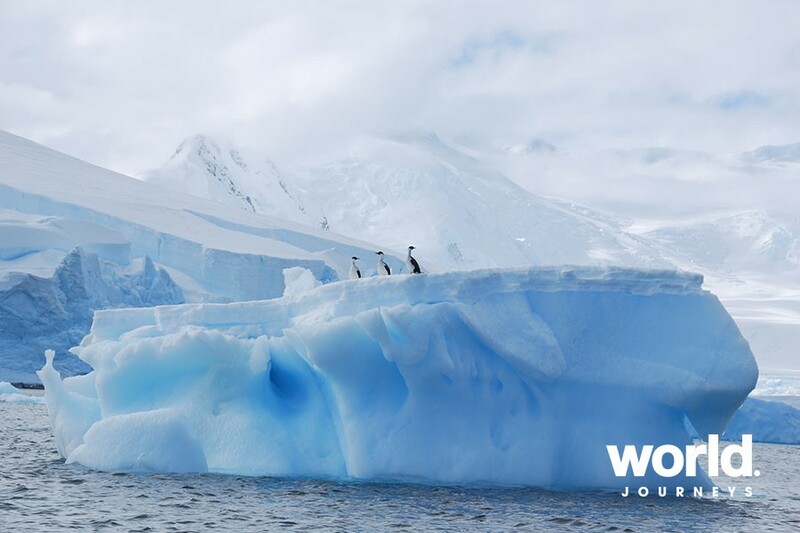 Here you'll have the choice between going for a mountain hike or spending time sitting quietly on a pebbled beach to enjoy the antics of curious penguins. Day 11: Disembarkation in Ushuaia with Charter flight back to Buenos Aires You will arrive in Ushuaia in the morning after breakfast. After disembarkation, you will have a little time to explore Ushuaia before we transfer to the airport for the return group charter flight to Buenos Aires. Day : Ushuaia, Argentina With a population of more than 63,000 people, Ushuaia is the southernmost city in the world. The city has grown over the past few years, yet it has retained an easy going and accessible feel. With the sea to the south and mountains to the north, Ushuaia is a spectacular departure point for your Antarctic cruise. If you arrive early, you can spend some time in the nearby Tierra del Fuego National Park, enjoy some Argentinean wines and barbeques in the city, or visit the many boutique shops and cafes before you leave for your expedition to Antarctica. Day 2: Embarkation Day Embarkation will occur in the late afternoon, after which your vessel will sail down the historic Beagle Channel. This famous channel transects the Tierra del Fuego archipelago in the extreme south of South America. Expect an air of excitement as you depart - the next time you see land you'll be in the world's most southern continent! Days 3 & 4: Crossing the Drake Prepare yourself for potentially rough water, but hope for a smooth sailing as the Drake is unpredictable and always changing. You'll spend these first days getting to know your shipmates, while we'll provide safety briefings and insights into what excitement lies ahead. 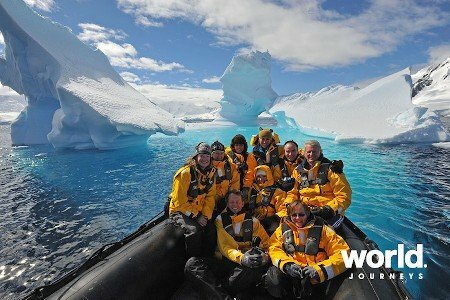 Days 5 to 9: South Shetland Islands and Antarctic Peninsula When the Antarctic Convergence is left in our wake, you will truly begin your Antarctic adventure. It is perhaps the first sight of land itself that is embraced as the true beginning of any Antarctic expedition. 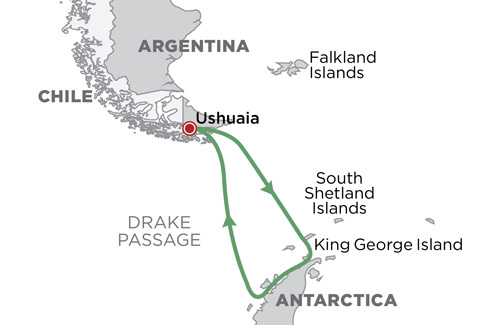 Days 10 & 11: Drake Passage to Ushuaia The journey back across the Drake Passage provides you with some final opportunities to enjoy the crisp Antarctic air. Spend time on the deck watching for seabirds and scouting for whales, enjoy a few final presentations by your Expedition Team or simply relax and reminisce about your experiences. Day 12: Disembarkation in Ushuaia You will arrive in Ushuaia in the morning allowing for you to continue your adventure on land or catch your flights home. Day 1: Buenos Aires, Argentina You may arrive in Buenos Aires at any time during Day 1 of the itinerary. Upon your arrival at this splendid city, known for its soaring architecture and rich European heritage, you will independently transfer to the group hotel (pre-night hotel included). Day 2: Ushuaia, Argentina and Embarkation After breakfast at the hotel, the group will transfer to the airport and board our private charter flight to Ushuaia, Argentina. Upon arrival, you will have a little time to explore this quaint port town before heading to the pier. Embarkation will occur in the late afternoon, after which your vessel will sail down the historic Beagle Channel. This famous channel transects the Tierra del Fuego archipelago in the extreme south of South America. Expect an air of anticipation as you depart - the next time you see land you'll be in the world's most southern continent! Days 5 to 9: South Shetland Islands and Antarctic Peninsula When the Antarctic Convergence is left in our wake, you will truly begin your Antarctic adventure. It is perhaps the first sight of land itself that is embraced as the true beginning of any Antarctic expedition. You can begin to appreciate why this region has long captivated the attention of explorers and travelers alike. 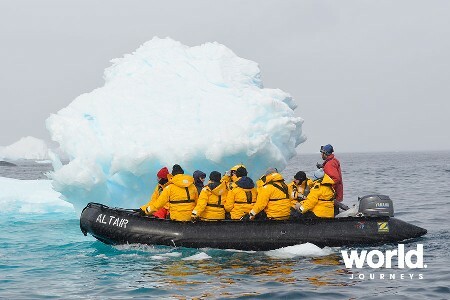 Every time we visit Antarctica we witness something new or unexpected, meaning your expedition will be unlike any other, creating a unique, personal experience. We will take Zodiac excursions from the ship to explore bays, channels and landing sites each day. 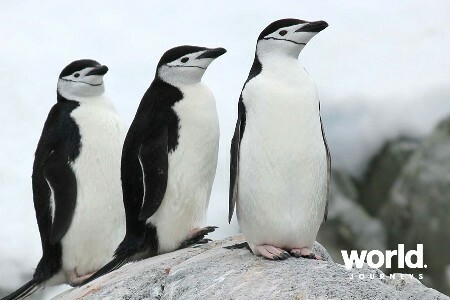 With wildlife always at the forefront of our minds you will visit penguin rookeries, scout for humpback and minke whales and search for a number of southern seal species, including the cunning leopard seal. The majesty of the Peninsula's mountains will enchant you as you scramble up snowy pathways to vantage points offering 360 degree views of your surroundings. One of these in particular, in Orne Harbour, gives the opportunity to visit a chinstrap penguin colony high up on a ridge. 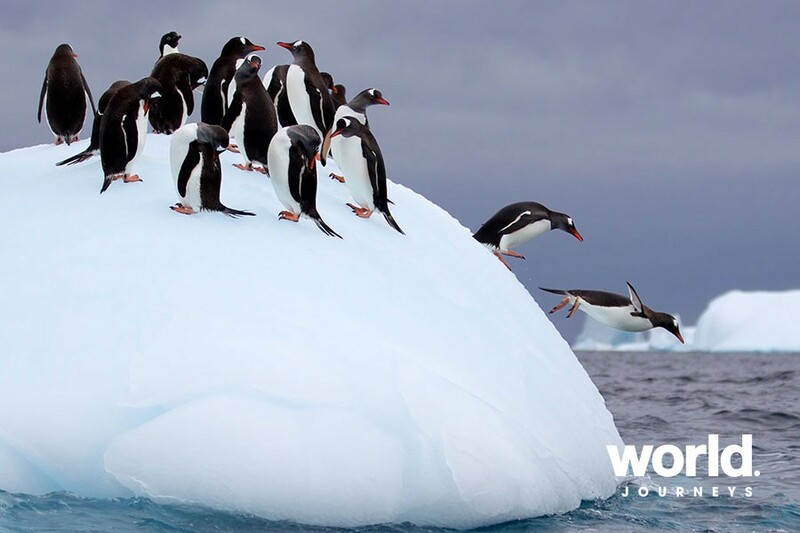 Here you'll have the choice between mountain hiking or spending time sitting quietly on a pebbled beach enjoying the antics of curious penguins. If you're feeling extra adventurous, participating in the Polar Plunge swim is about as crazy as it gets! Days 10 & 11: Crossing the Drake Passage The journey back across the Drake Passage provides final opportunities to enjoy the crisp Antarctic air. Spend time on the deck watching for seabirds and scouting for whales, enjoy presentations by your Expedition Team or simply relax and reminisce about your experiences. Day 12: Disembarkation in Ushuaia (Charter Flight back to Buenos Aires) We will arrive in Ushuaia in the morning after breakfast. After disembarkation, we will taste a little of Patagonia by touring Tierra del Fuego National Park before we transfer to the airport for the return group charter flight to Buenos Aires. **Also included during expeditions aboard the Ocean Diamond: • Snowshoes available on loan for shore excursions on designated voyages. • Headsets available on loan for listening to staff presentations and commentary. • Access the world's largest floating collection of polar books and DVDs in many languages. • Yoga classes and onboard wellness program. • A comprehensive photography program that includes the services of a resident photography instructor, a program of lectures on photography and digital image manipulation, photography focused excursions at landing sites. Also included during expeditions aboard the Ocean Adventurer: • Snowshoes available on loan for shore excursions on designated voyages. Important reminder: Embracing the unexpected is part of the legacy and excitement of expedition travel. There are no guarantees that we can achieve everything we set out to accomplish. A measure of flexibility is something all of us must bring to a voyage. There are nearly 200 recognised sites in the Antarctic Peninsula and South Shetlands and the places mentioned above may be changed to others equally as interesting. Single travellers will be matched with another traveller of the same gender and pay the share twin price. Single travellers who wish to have their own cabin, please enquire. Save up to 25% on select 2019 & 2020 departures! Book by 30 April 2019 to save up to 25% on select departures Nov 2019 to Mar 2020.